Ryoko is the first born of the Takato family and allots of the pressure of being the role model is placed on her shoulders. Perfect grades, perfect service and only to bring honor towards her family. This makes her a difficult person to reach personally, she is strict towards duty first and last. With both her sisters Hayashi and Isamu below her, she tried her best to be a guide for them. Born on 2351 under the care of Kei and Rinko Takato on the USS Bradley. She lifts a strict life of doing good studies, good grades and learns about the functions and duties of a Federation officer. It was most of the times a struggle for the young Ryoko, but with the coming of Hayashi, her parents became milder in their judgment. It was only logical that she would enter the Starfleet Academy, it was not her prime wishes but she did not object her father wish. Entering the Academy she did what was expected of her, serve above duty as the perfect student should be. Not getting into any trouble, yet no friends. Her focus was primary her study and the instructors had a talk with her family about this, but Kei did not want to hear anything about it. When she finished her academy degree, Ryoko was officially an Ensign in the field of Operations. She was assigned towards the USS Valkyrie as a Cryptology Specialist. The Federation, however, was in the state of war, the USS Valkyrie was sent into combat to support the federation front as much as they could. Ryoko duties became more important than she would have presumed. Together with the intelligence branch, she was the key factor of using a secret way of coordinating communication across the borders that saved hundreds of lives. Later on, she was promoted and reassigned towards the Chief position for her duties in the field. At the final days of the war in 2375, the Federation began their attack at the Battle of Cardassia. USS Valkyrie was among those ships, Ryoko was responsible as one of the communication factors to bring out the tactical information towards all ships. 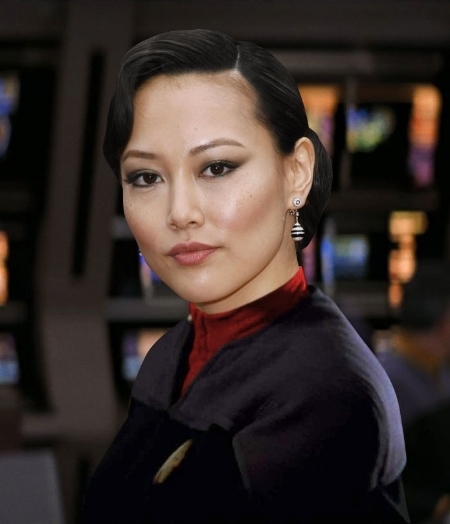 Yet when arriving at the bridge, she noticed how much damage was done already as the bridge crew was doing its best to survive the huge battle. Ryoko replaced the now deceased Chief Operation Officer and with a little experience she had in doing these controls, she assumed her duties and helped the crew of Operations as much as she could. After the battle the USS Valkyrie was beyond repairable, the crew was saved and awaited new assignments at Starbase 1. Ryoko was promoted towards Lieutenant JG due to her actions of bravery at the battle and assigned towards USS Ramses as its new Assistant Chief Operation Officer. For some years she served the vessel and yet came with the same issue she had in the Academy and the USS Valkyrie, no friends. It was only then that a girl named Arila Webb did her best to gain her attention and Ryoko recognized her as her first real friend. In the years she had served the USS Valkyrie she was reassigned on the recommendation of her own Captain towards the USS Liberator. Her duties resumed under the flag of being their Chief Operation Officer. The duties of the Liberator was pure on borders of the Romulan Star Empire and keep them in check. They were sent towards over the borders sometime to do diplomatic missions with the RSE. Most of the meetings, Ryoko was with them record their conversations as deception was a second nature for these Romulans. Starbase 37, required on an urgent matter a Chief Operation Officer and the USS Liberator heated that requirement against its Captain will. Ryoko was reassigned towards a dusty old base to help the Chief Engineer Officer to patch up the systems and get everything rolling again. The Commanding Officer was glad to get some support. Ryoko somehow misses ability to fly in space, but her sadness was gone when she noticed that Arila Webb was assigned towards this base as well. In 2385 she was given the promotion and assigned the position of Executive Officer of Starbase 37. In 2387 she finally gets her own command the USS Tornado-C. A ship with a history and drive to continue into the unknown. In 2388 she received the order of her family to not intervene with the arrest of her sister Isamu. Against her own will, she did not object against her father demands. Yet kept close contact with her sister Hayashi and Reaya security to keep herself in the loop. Tornado resupplied at Providence Fleet Yards to resume its duties on the borders. Ryoko had to make a detour towards the Reayan Transit Corridor where the crew had to face temporal ruptures and somehow Ryoko managed to retrieve the MTRF station back to its original spot, but not the timeline. After some weeks of traveling, they finally arrive at Sut HabmoHwI’ mupwI’ in the Narendra System. Their goal was to get information and support the House of Darg in their tournament. However, it ended up with Ryoko getting shot in the side that comatose her for three weeks and Tornado damaged on its rear hull. Now that Ryoko got back in her chair, things are getting heavier and heavier for the Captain shoulders. Yet in a dramatic turn of event the Sovereignty of Kahless was born and the Tornado found herself surrounded by their ships. The only choice that was to be made was done, Ryoko sacrifice herself to save her crew and turned herself over towards the SoK forces. The Tornado turned around and left the area leaving their Captain behind. Ryoko was now going to be exposed towards months of torture and Klingon amusement. After 4 months of being a prisoner of war, Captain Takato got rescued ironically by her own crew of the USS Tornado-C. She was however not fit for duty to command a vessel again due to the traumatic captivate state. After a few months of recovery, she returned into active duty as Communication Director within Task Force 93 to improve the communications in all sectors where Task Force 93 operates.